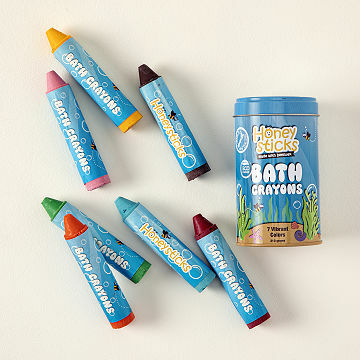 Made of non-toxic ingredients, these child-safe crayons encourage bathtime creativity—and wash off easily. Here's how these work. 1) The grownup draws the bath. 2) Kiddo draws on the bathtub and wall tiles. 3) Nobody gets mad—because these crayons wash off easily from most bath surfaces. They're safe, too, made with natural, non-toxic ingredients like bee and soy wax and food-grade pigments. If kiddo puts them in their mouth, no big deal, even if they chew. Their chubby shape makes them easy for little fingers to hold, and hard to break. Since you can't hang the bathtub on the fridge, take a photo, quick, before the masterpiece is washed away. Seven colors: light blue, red, green, orange, pink, yellow, and brown. Package has drainage holes at the bottom for easy cleanup and storage. Handmade in New Zealand. 100% Pure New Zealand Beeswax, sustainable renewable soy wax, Food Grade Non-Toxic Pigments. Always supervise children when using, never leave children unattended in water. Product may stain certain porous surfaces such as unsealed tiles or grout; only use on washable hard bathroom surfaces. Do not leave in water for periods longer than a standard bath time. Avoid eye contact with crayons. Intended for bath use only. Wash off any color residue from skin with clean soapy water. While these looked awesome since they are beeswax, they are nearly impossible to clean off tub surfaces. Plus the crayons broke apart upon the first use. I do not recommend. These crayons will NOT come off the walls or tub! We scrubbed for nearly an hour and barely anything came off. Extremely upset! Our beautiful bathroom is now covered in red crayon! Terrible product!!!! I don't recommend these. Sorry! My kids love painting and coloring. Artwork in the bathtub is a win win because it is so easy to clean up. Inevitably one of my kids gets it in their mouth so I am grateful that this is natural and non toxic if they do take a bite. I hope that my nieces and nephews enjoy it for Christmas.